Biryani taste even more delicious with a side gravy which brings its own unique taste. Every restaurant serves biryani with dahi raita and this side gravy dish in a small bowl. The quantity is so small that we end up using it as a chutney/spread with biryani. The home made gravy is an easy and close to restaurant flavor recipe. Heat oil in a cooking pot. Add Black pepper, cumin seeds, fennel seeds, cinnamon, cloves and cardamom. Saute for a few seconds. Add onions and saute till transparent. Add ginger garlic paste and saute till onions turn golden. Add tomato, green chilies and ginger. Saute for 4-5 minutes. Add salt, red chili powder, turmeric and coriander cumin powder. Mix them all well. Add chicken and cook on slow gas for 10-15 minutes or till the oil separates. Garnish the gravy with coriander leaves. Serve it with Biryani, pulao, parantha, dosa or just with chapatti. Works in lot of ways! Click the respective link to check out our recipes for Biryani, Vegetable Pulao and Aalo Parantha. And remember to follow us at Facebook, Twitter and Pinterest. 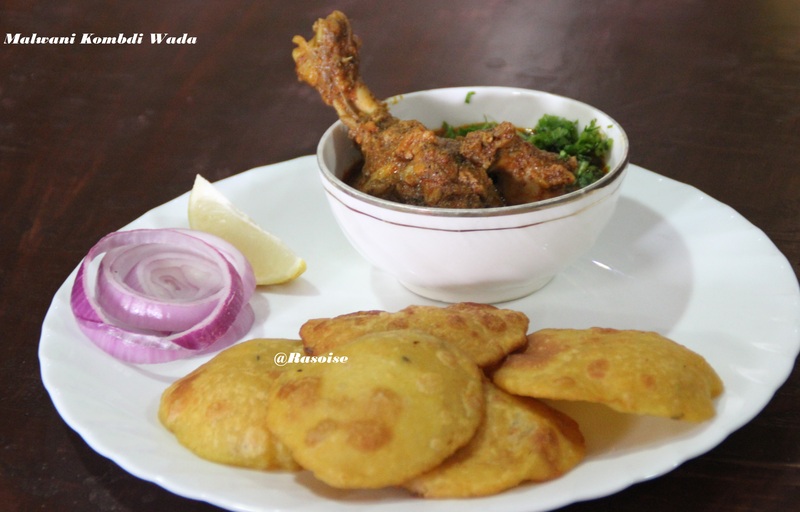 Kombdi Wada is a non-vegetarian dish from Malvan, southmost district in Maharashtra. Malvan dishes are mostly famous for spicy-ness and quirkiness in them. 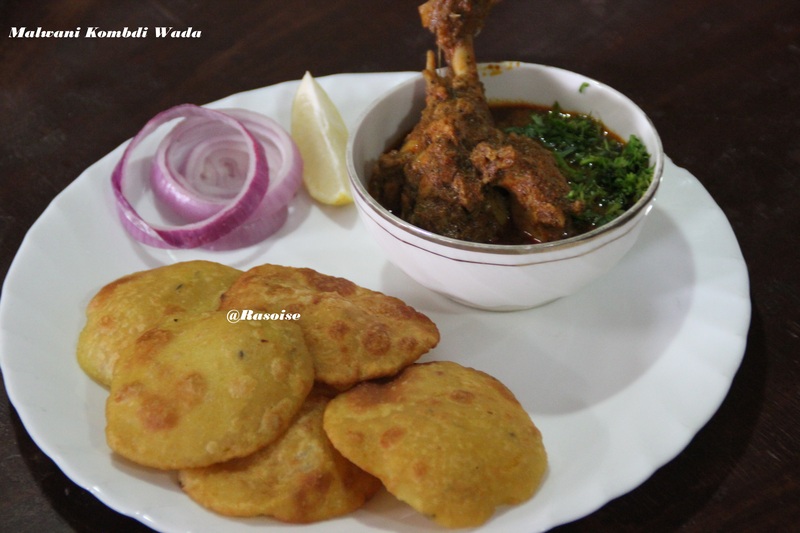 Kombdi wada is traditional chicken gravy and puri (wada) combined dish, served with onion, lemon and solkadhi. Malvan is also home to beautiful virgin beaches and historical monuments like Sindhudurg fort. I visited Malvan for the first time after my marriage and it was heavenly. Take fresh live chicken in a bowl; wash it under running tap water for, if any, impurities. Using a butcher knife, remove the unwanted skin from the chicken. Take another cooking pot and add 2 onions chopped and grated dry coconut. Cook them till the onion turns golden brown. Once done, turn off the gas and let it cool. Now transfer it to the mixer and grind it to make it a fine paste. Take a big cooking pot and add two spoon full of oil to it. Add rest of the 2 chopped onions to hot oil. Let it cook for few minutes till the onion turns light golden brown. Now add tomato and ginger garlic paste to onion. Let it cook for few minutes till oil separate. Now add Malwani Masala and garam masala. Also add turmeric and salt. Mix. Now add some water to the gravy and then add chicken to it. Cook it for 10 mins if it is a broiler or cook for 1 hour if it is a gauti chicken. Keep stirring the chicken. Now add the onion coconut paste which we had already prepared. Let chicken cook for 10 min. Add soaked cashew pieces to the ready Kombdi gravy. Take rice flour, jawar flour, chana dal flour, urad dal flour, coriander powder, jeera, methe seed powder in a cooking pot. Cook them for few minutes. Take the ready flour in a big mixing bowl. Add salt, bhuna jeera, Ajwain, fennel seeds (saunf) and freshly cut coriander leaves. Mix everything with your hand to make dough using luke warm water. Make sure the dough is not too hard or too soft. Make this dough atleast 7-8 hours before making the wada. Heat oil into a wok for frying. Make small equal sized balls out of the dough. Put a plastic on the chapati board and roll each ball into a puri over this plastic. Place the puri into the hot oil for deep frying. Fry till wada gets golden brown from both the sides. 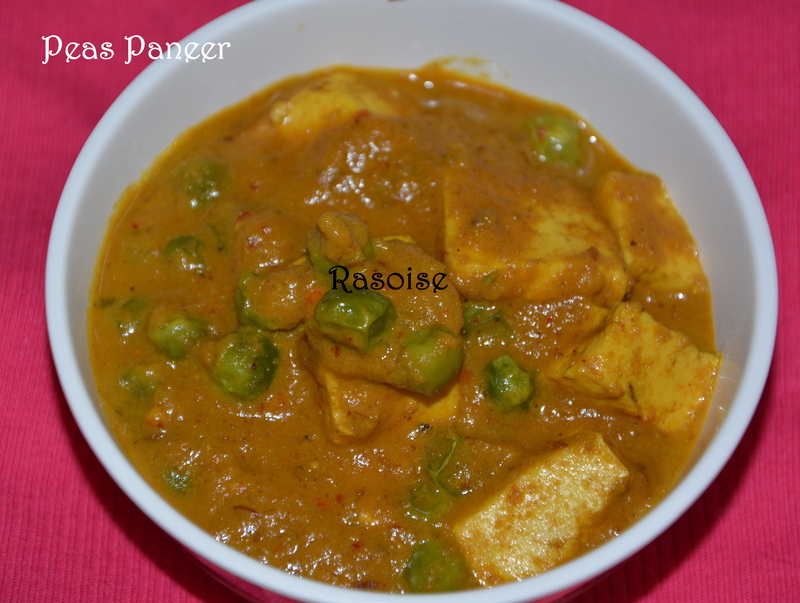 Serve it hot with Onion, lemon and Solkadhi. 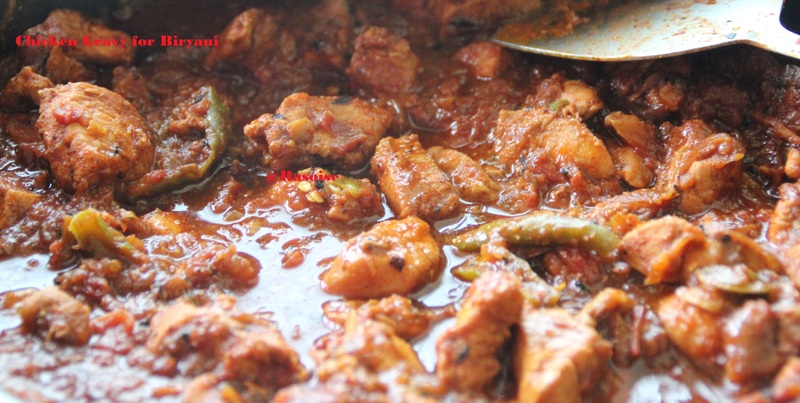 This recipe is best done with live chicken such as broiler or gauti chicken. 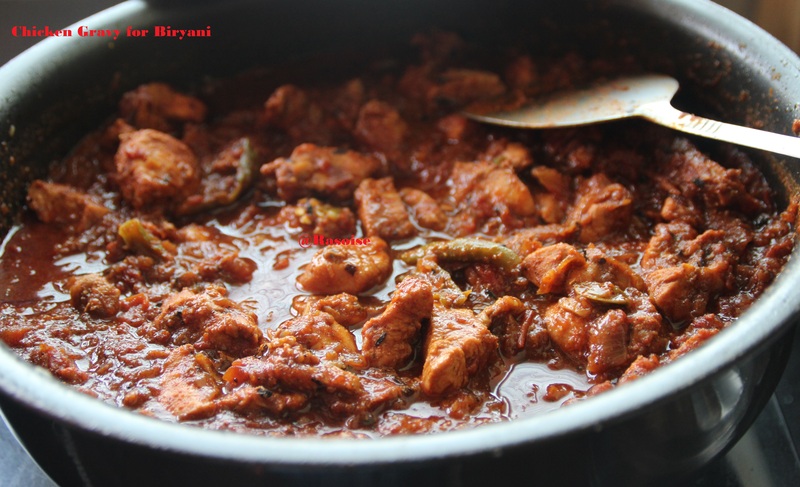 Boneless chicken is best used for other chicken recipes such as butter chicken. Do not pressure cook the chicken to reduce the cooking time. It will take away the flavor and chicken can get overcooked. Malwani masala can be made at home or it is easily available in market as well. If you like you can add Turmeric and red chili powder in the wada flour. Heat the oil in a pan on medium heat. Once hot, add cumin seeds. Let them sizzle. Add ginger garlic paste and sauté for a minute. Add chopped onions and green chilli. Saute for another two minutes. Add blended tomatoes. Mix well and stir continuously till the raw smell goes away. Add salt, red chilli powder, turmeric powder, garam masala, coriander powder and mix well. Add the boiled black chana and stir continuously till it comes to a boil. Let it cook on low flame for another ten minutes. If you want to dilute the gravy add water. 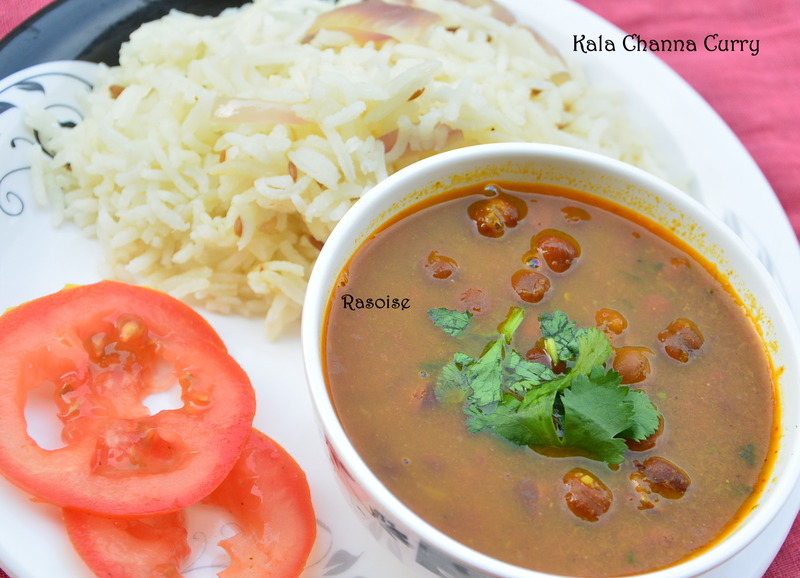 Black Chana Curry can be served with Indian breads like roti or paratha. It also tastes delicious with jeera rice. Last year I went to Ladakh on a tour. During that tour we visited a place named Nubra Valley. There were small huts made of bamboo sticks. A different place to visit. Well the chef of the kitchen was very friendly and after almost 10 days we got an opportunity to eat home made food. The chef gave us an opportunity to cook with him. And this recipe is from his kitchen !! Heat two tablespoon of olive oil in a non stick pan. Add little salt, a pinch of turmeric powder, ½ tsp red chilli powder. Put paneer pieces . Sauté light handedly and cook for two minutes. Close the flame. Boil a glass of water in a pan. Put the peas in the boiling water and keep it aside for fifteen minutes. This will make peas little soft. Heat two tablespoon of olive oil in a non stick pan and add jeera, green chilli, garlic cloves and ginger. Sauté for a minute and add onion pieces. Saute for another two minutes and add tomato. Add salt, turmeric powder, coriander powder, red chilli powder, garam masala, cardamom powder. Saute till you get nice aroma and color of all the spices. Let it cool. Add this point add a few drops of cooking red color (this is optional, I generally do not use any colors). Now transfer the mixture in a grinder and add milk. Heat butter in a nonstick pan and pour the mixture from the grinder. If the mixture seems to be little thicker you can add more milk. Sauté for two minutes and add peas. Let it cook on slow flame with covered lid for next ten minutes. Saute in between. Add paneer pieces, sauté for one minute and close the flame. Garnish with chopped coriander leaves. Serve hot with Naan, kulcha or paratha!! 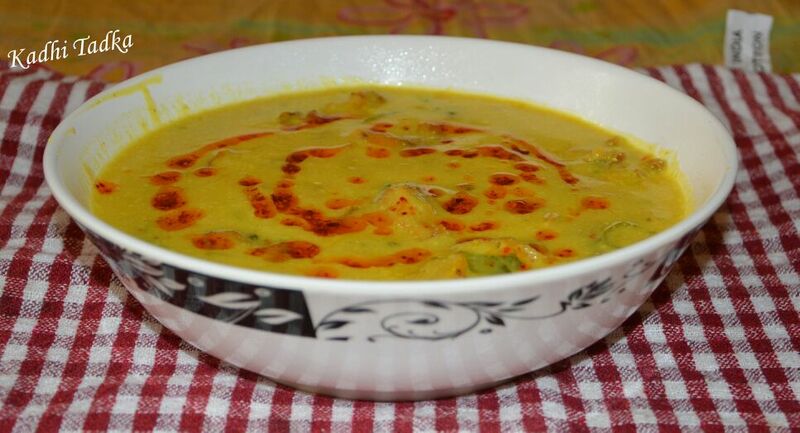 Kadhi is a very famous dish amongst Punjabis’. 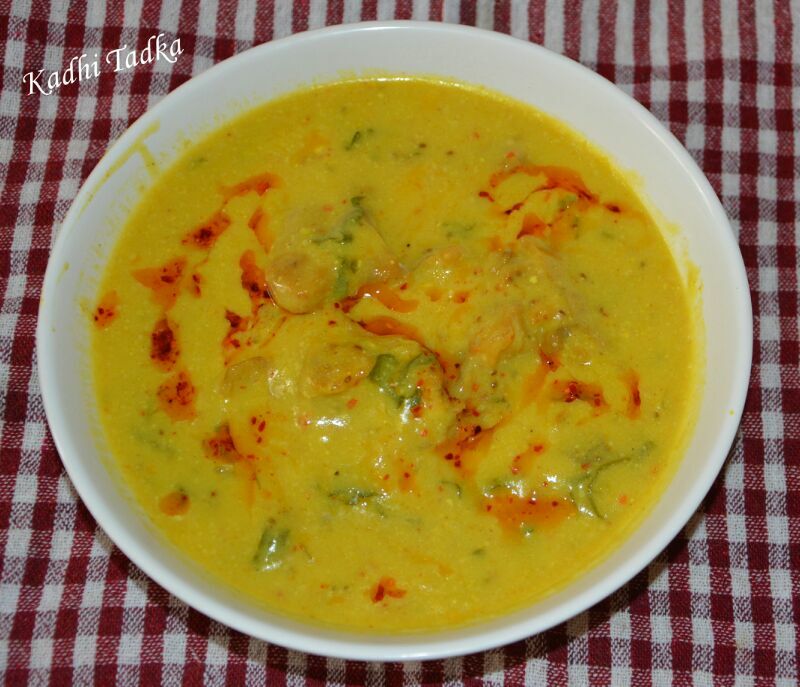 Kadhi is a blend of yogurt and besan (gram flour) with besan pakoras. 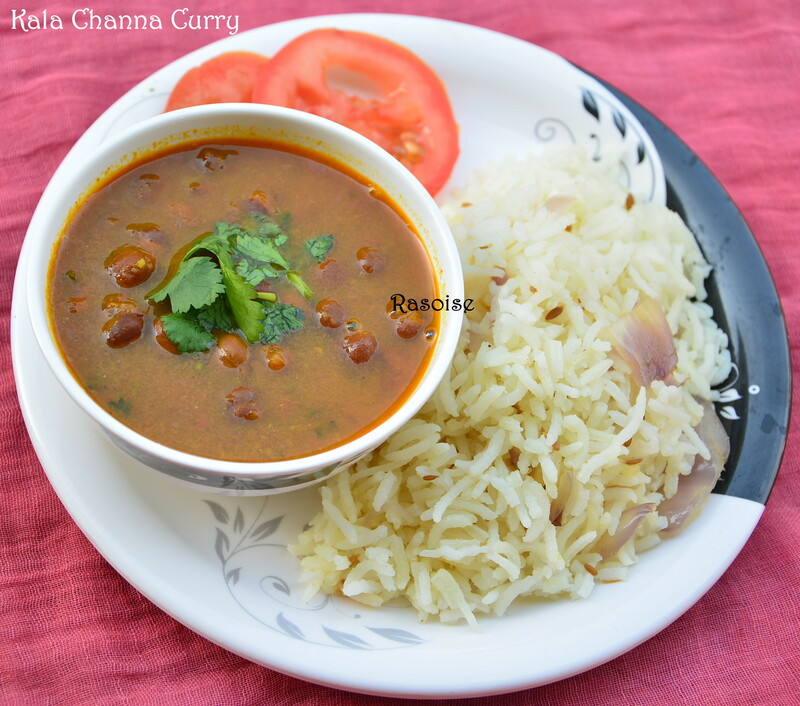 Kadhi is served with white plain rice or jeera rice. I learnt this recipe from my mother and believe me her preparation is the best !!!! Sharing the recipe with you all !! 1. Mix gram flour/besan in a bowl with ajwain, red chili powder, turmeric powder, hing and salt. 2. Add sliced onions and potatoes to the bowl and pour a little water. Don’t add too much water as the onions will release water after some time. 3. Gently mix the onions and potatoes with the besan and keep it aside for fifteen minutes. 4. If the batter is still dry, then add some water to it. 6. Fry the pakoras till they crisp and browned. 7. Drain on kitchen paper napkins or tissues. Pakoras are ready !! 1. Pour the curd in a big bowl. Beat / blend it well to make it smooth and add the spice powders – turmeric powder, coriander powder, red chili powder, garam masala powder and salt. Mix them well. 2. Add the gram flour/ besan to the spiced curd. 3. Pour two glasses of water and mix them well. Make sure it is mixed and blended well and no lumps are created. 4. Heat oil in a heavy base wok, add ajwain, green chilli, curry leaves, ginger garlic paste, chopped onion and finally dry red cilli. 5. Saute till the raw smell of the garlic ginger disappears. 6. Now pour liquid curd mixture. 7. Bring the whole kadhi to a boil first and then simmer for atleast fifteen minutes. The simmer time will definitely depend on the thickness of the kadhi. 8. Once the Kadhi is of desired thickness, add the fried pakoras to the hot kadhi . 9. Cover and close the pan. Let the pakoras be soaked in the kadhi for few minutes. 11. Also while serving, heat desi ghee, add little red chilli powder and spread it on the Kadhi. 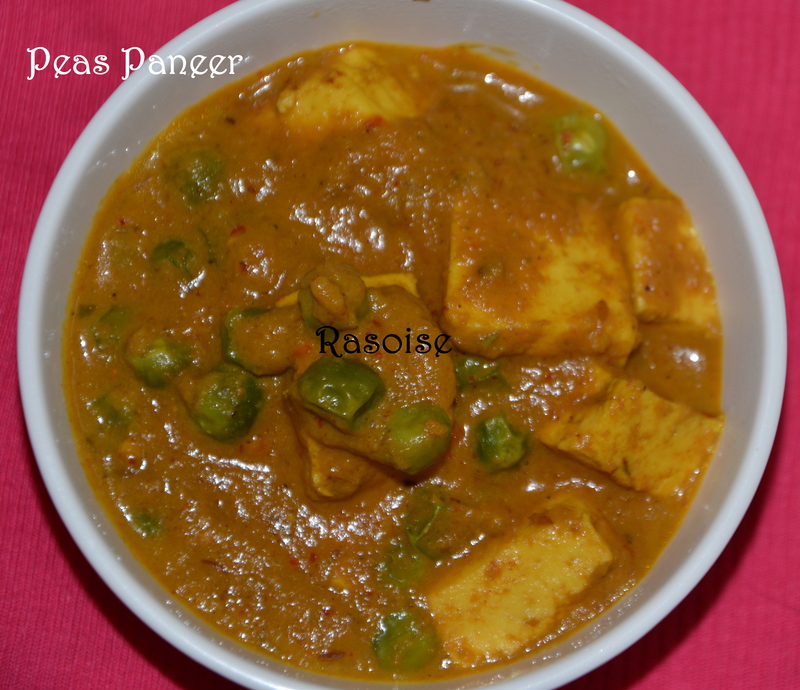 Serve hot with plain / jeera rice !!!! Try this recipe and please share your comments.